Fidencio Diaz-Eguiza charged with attempted murder after he allegedly shot his wife in the shoulder. Authorities say a man accused of shooting his wife in their home near the Sunset Esplanade hid in a cabinet for hours, as he attempted to outwit police officers. 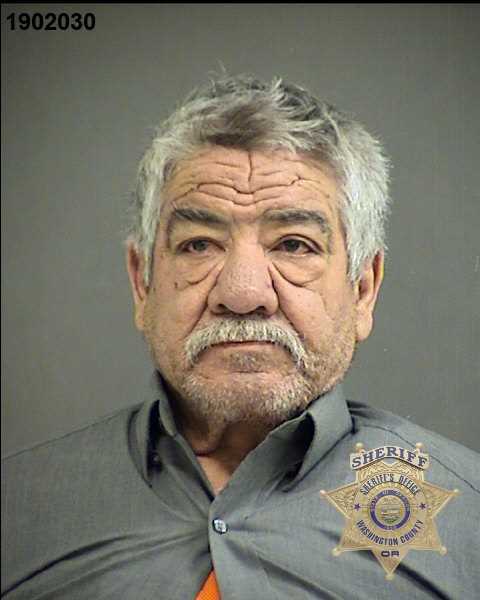 Fidencio Diaz-Eguiza, 61, of Hillsboro is charged with attempted murder, second-degree assault and unlawful use of a weapon after police say he tried to kill his wife during a domestic dispute on Sunday, Feb. 10. Police were called to a home in the 2700 block of Southeast Tumblestone Drive at about 4:16 p.m., Sunday, after receiving a report of shots fired, according to Hillsboro Police spokesman Sgt. Eric Bunday. Arriving on the scene, police found a 59-year-old woman, whom police have identified as Diaz-Eguiza's wife, suffering from a serious gunshot wound to her left shoulder. The woman was taken by ambulance to a nearby hospital. She is expected to survive, Bunday said. Police shut down the area, Hillsboro Police sent police K-9 teams through area neighborhoods, searching for him. Residents in the area were told Diaz-Eguiza should be considered armed and dangerous. But police found Diaz-Eguiza at 1:40 a.m., Monday, Feb. 11. Police were conducting a search of the home when they reportedly discovered Diaz-Eguiza inside a cabinet in the home's garage, Bunday said. Bunday said it's likely that Diaz-Eguiza was in the cabinet for hours while police investigated the scene. After he was found, police arrested Diaz-Eguiza without incident, Bunday said. Diaz-Eguiza was lodged in the Washington County Jail. He is expected to be arraigned Monday. Police have not released a motive for the shooting. Bunday said other people were in the home at the time of the shooting, but declined to release further information. "If folks find themselves in a relationship involving domestic abuse, there is the Family Justice Center of Washington County right here in the area," Bunday said. "That is a good way to obtain help and retain social services for anyone who needs them." Hillsboro Police was part of an effort to launch the center, which opened last year at 735 S.W. 158th Ave., in Beaverton.